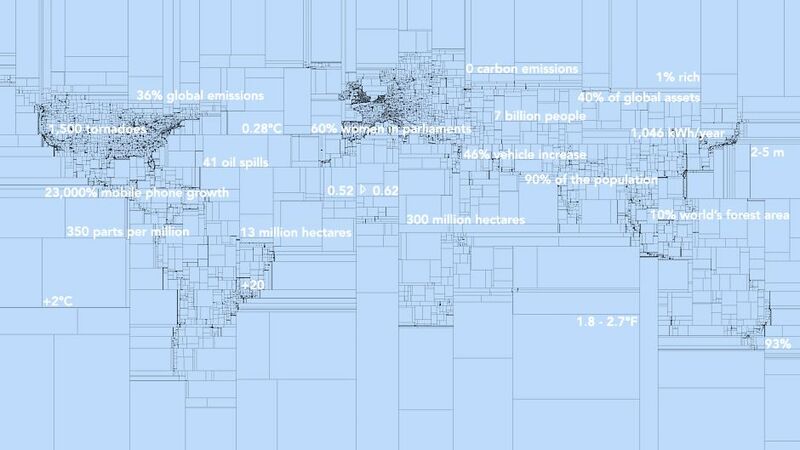 Seven billion people; 350 parts per million; 2°C warming; 13 million hectares per year. All of these numerical indicators for environmental change are important to know. Solid, up-to-date data provides the basis for understanding the limits and benefits of natural ecosystems that support human life. Before we can design clever and sustainable solutions, we need to diagnose complex environmental problems. Or to frame it another way, to know where we are going, we must know where we have come from. But with so many government, non-government and research organizations with overlapping but frequently competing agendas producing so much data, the task to break through a wall of numbers becomes even harder. For citizens across the world it is challenging to select what information matters and what doesn’t, especially when there are corporate and media forces attempting to distract us from the most critical knowledge. Keeping Track of Our Changing Environment: From Rio to Rio+20 (1992-2012) attempts to assemble all of the key statistics on the environment in one accessible place. The report forms part of the United Nations Environment Programme’s (UNEP) reporting process for its fifth Global Environment Outlook. It attempts to “tell the story of where the world was 20 years ago and where we collectively stand today, and to show the direction in which we need to move in a post-Rio+20 world”. The most obvious trend confirmed by the report is that an immense amount of change across the globe has taken place in the last two decades, including a rapid expansion of international trade underpinned by the evolution of the Internet and other technologies that make transportation, communications and manufacturing quicker than ever before. The simultaneous revolution in development has seen record numbers of people alleviated from poverty, particularly in the BRIC (Brazil, Russia, India, China) and other countries in Southeast Asia and South America. The consistent increase in the Human Development Index, from 0.52 to 0.62 from 1990 to 2010 is the most comprehensive indicator of improvement in human health and well-being. Yet while development outcomes for millions of people have been good, more stress than ever is being placed on the planet’s resources. It will come as no surprise to Our World 2.0 readers to hear that from 1992-2010, global emissions rose 36% and ocean temperatures rose 0.28°C. But in meeting the growing global demand for timber, food and household products, the world’s forest area declined by 300 million hectares since 1990, an area equal to the size of Argentina. Admittedly, the big picture looks bleak. But the last two decades have also brought some impressive enhancements in environmental governance. For instance, the number of oil spills annually has been trending down from 41 in 1992 to just 8 in 2010, as has the quantity of oil spilled. From 1992-2009, consumption of ozone-depleting substances declined a significant 93% and as of September 2011, expansion of the “ozone hole has halted”. Progress here has been due to the nations of the world almost unanimously accepting the terms of the Montreal Protocol (1987), described by Former UN Secretary-General Kofi Annan as “[p]erhaps the most single successful international agreement”. Of course, drastic changes need to take place in the coming decades in a whole host of environmental areas identified in Keeping Track, including plastic waste, fisheries and biodiversity conservation. But the point is that current and future efforts by environmental justice activists to pressure governments to more tightly regulate and if necessary punish polluters can pay off, as they have in the past. Let’s hope then that the number of signatories to Multilateral Environment Agreements (MEAs), where more than 60 countries have signed all 14 of the major MEAs according to UNEP’s research, continues to increase. Still, UNEP remains circumspect, pointing out that the signing of an agreement does not necessarily mean a country has solved that particular environmental problem within its borders. The world’s human population has reached 7 billion. But this population is increasing at a decreasing rate and is predicted to stabilize at around 10 billion people. The world’s carbon emissions are rapidly increasing. But there has also been a “simultaneous general decline in emissions, energy and material use per unit of output”. Only 10% of the world’s forest area is under certified sustainable management (under the two largest regimes, the Forest Stewardship Council and the Programme for the Endorsement of Forest Certification ). But there is a 20% increase annually in the amount of certified forests. Half of the people living in developing regions have no access to “improved sanitation” (what that means exactly is unclear). But by 2015, 90% of the population in developing regions will have gained access to improved drinking water. A common thread throughout Keeping Track is that there are some trends that may be turning for the better, albeit slowly. This is not to say that we should lessen our concern about hypercritical issues like biodiversity loss, climate change and ocean acidification. Rather, there are nuances that exist when considering the environment and development — the picture is complex and, particularly for emerging middle classes in developing regions, not always doom and gloom. Keeping Track delves into rapidly evolving areas of modern life that need to be considered more broadly by mainstream thinking about the environment and sustainability. There is a small but important section on the Internet and mobile phone technology. The growth of mobile phone usage by a whopping 23,000% since 1992 now means that more than 5 billion people are benefiting from fast, relatively cheap, decentralized and democratic communication from one corner of the Earth to another. In addition to making business and personal communications easier, such technologies are critical for acquiring improved scientific monitoring information at local levels in developing regions that presently lack capacity for large scale and accurate data collection — a requisite need for improved environmental governance according to UNEP. The downside of this phenomenal growth in use of communications technologies is e-waste, that contains hazardous chemicals that produce health and environmental side effects. This problem will only get worse as development propels increasing consumption of tablets, laptops and IT technologies we may not even know exist yet in ever more parts of the world. This will put further pressure on the supply of already “rare metals” that are essential product components. Did you know that the proportion of seats held by women in national parliaments has increased 60% since 1997? The report includes other unexpected figures and trends like this one that may not have always been primary considerations for environmental policy. This indicator is admittedly just one dimension of increasing gender equality in a world where women and children are disproportionately affected by environmental degradation and pollution. By including it, UNEP is recognising that women in executive positions can play a key role in ensuring better environmental policy, in the same way that women’s inclusion in peacebuilding processes can ensure more gender sensitive rebuilding in post-conflict countries. Inclusion of fresh but relevant themes could reflect increasing appreciation within the UN of the importance of holistic and trans-disciplinary approaches to understanding and transforming interlinked social and environmental challenges. The broad challenge now, in developed and developing regions alike, is to recalibrate national policies to be less sectoral-specific and enable decentralised planning that reflect local conditions and contexts. Does it make sense for agriculture to be dealt with in a separate department to “the environment”, or for housing and transportation policies to be de-linked in a departmental structure because “they always have been”? Keeping Track appropriately illustrates that everything is connected to everything. This report is proof that, through restrained use of technical language and intelligent application of design tools and graphs, complex messages can be conveyed to wider audiences. Overall, Keeping Track does a good job of explaining to us where we have come from. Where we are going is now up to all of us. The environment in numbers: 1992-2012 by Mark Notaras is licensed under a Creative Commons Attribution-NoDerivs 3.0 Unported License. Mark, thank you for the excellent summary. What worries me especially is the lack of raw metal for the increasing demand of mobile devices. We heard recently a presentation about “Peak Metal” which is as threatening as “Peak Oil”. We have a Peak on many things Schmid91. I saw a japanese documentary about “Peak Uranium”. Maybe that’s one of many reason nuclear industry is supporting “mox fuel”.